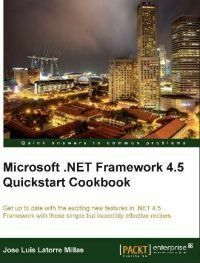 Microsoft .NET Framework 4.5 Quickstart Cookbook by Joe Luis Latorre Millas is yet another .NET 4.5 focused book, I received a free review copy from Packt publishing. Although I wasn't really sure at first whether it makes sense to read more books on the subject, I'm glad I did it. Taking the complexity and scope of .NET 4.5 into consideration, I was quite surprised by how thin the book actually was. Even more so, after I've taken a closer look at the table of contents: the book covers a very broad spectrum of topics. The author really managed to convey a lot of information in a concise and useful way. It has to be said, though, that not all of the topics are covered equally well: some really do shine, while others could still be improved. I was very pleasantly surprised by the quick introduction to Windows Store apps. I don't think I've come across a better one in such a short form. I also liked very much the core CLR, WPF and Web API chapters. All of them are well worth reading. The only chapter I really can't give any praise, is the last one on WF. It's really difficult to follow without good prior knowledge, but once you have that knowledge it doesn't offer you much. The WF topics to dive deeper into, could definitely be selected better. In spite of that I can still recommend the book to anyone already having solid knowledge of .NET 4 and wanting to learn more about the new stuff in .NET 4.5. I'm pretty sure that even almost a year after the release .NET framework 4.5, most of the readers will still learn at least something new. I know that I haven't known about a couple of things before, although I've been using it regularly since the release. On the other hand, don't choose this book to start learning about .NET; you won't get much out of it.